Posted on Fri, Mar 16, 2012 : 5:58 a.m. The Washtenaw County Road Commission will bond for $6 million to do a series of road projects in Ypsilanti Township that will largely be completed over the next two years. The projects will coincide with nearly $10 million of water main replacement work along the same roads by the Ypsilanti Community Utility Authority. The township also is planning on an additional $800,000 in projects it expects will be covered by Community Development Block Grants distributed by Washtenaw County over four years. Road Commission and YCUA officials discussed the projects with the Ypsilanti Township Board of Trustees at a March 12 meeting, though no action was taken. The intersection at Merritt and Whittaker roads is among those that will see some improvements. The Road Commission is bonding for the projects because there is less red tape for it to bond. The bonds will be paid back by the township over 10 years . Whittaker Road between Merritt and Bemis roads. Martz Road between Tuttle Hill and Rawsonville roads. McKean Road between Martz and Textile Road. Bridge Road between Textile and Grove Road. Forest Ave. between Ford Boulevard and Midway Road. Bunton Road between Bemis and Textile. Tyler Road between Wiard Road and Airport Road. Clark Road between LeForge Road and Ridge Road. Merrit between Munger Road and Stoney Creek Road. Mott Road between Ridge and the Wayne County line. McGregor Road between William Road and Tyler. The Road Commission and township are also seeking matching state and federal grants on improvements at the Textile and Stoney Creek intersection; Textile and Hitchingham Road intersection; Whittaker and Merritt intersection; and Rawsonville and Martz intersection. An additional $4 million worth of work on 30 miles of neighborhood and subdivision roads also is slated for the upcoming construction seasons, and township officials are planning to spend a yet-to-be-determined sum from their general fund for preventative and maintenance work. “Historically, the township has invested in its infrastructure,” Supervisor Brenda Stumbo said, highlighting that the roads in the township are in better condition than other municipalities in the area. Roy Townsend, an engineer with the Road Commission, told the board that 75 percent of the township's local roads are in good or fair condition, compared with 25 percent of local roads in the rest of the Road Commission's jurisdictions. He attributed that to investment in maintenance work, and said such investment saves money in the long run. so if you spend a dollar now you are going to save $6 later." The township was considering bonding for $4 million to $5 million instead of $6 million, but decided to take advantage of interest rates that are around 2 percent. Officials also wanted to take advantage of the work to allow the YCUA to complete projects along the roads and save money. “The opportunity to make improvements to the water supply system in conjunction with the paving work allows for an economy of scale to be realized that will provide the most efficient use of both road and utility funds,” YCUA Director Larry Thomas said. A nearly $3 million project in the area of Ecorse Road, Emerick Street and Interstate 94 will provide 16,000 feet of new water mains up to three times the size of the 4-inch pipes installed there in 1943. That area has experienced 30 water main failures over the past 20 years. A similar project near Snow Street, Bradley Street and I-94 will replace 14,000 square feet of pipes. That area also has seen frequent main failures in recent years. Nearly 14,000 feet of new pipes will be installed in the Smokler-Textile Subdivision. Mains there have been failing at an increasing rate in recent years and cost for the project is estimated between $1.8 million and $2.6 million. Portions of the Pines Subdivision will receive 5,500 feet of new piping at a cost of $1.1 million, and the Pasadena Street and Outer Lane area will see 3,000 feet of new mains. The Fairview Heights neighborhood also will receive some new pipes. All three areas have experienced a high number of main failures. Among other projects not included in the bond total is a joint venture among the YCUA, Pittsfield Township and Ypsilanti Township on Golfside Road between Packard and Clark roads. That part of the road will see a resurfacing as well as sanitary sewer work. The $1.1 million project is expected to begin in May and continue through July. Fri, Mar 16, 2012 : 7:05 p.m.
What about grove rd at 94? it looks like it has be threw a lost war over there. Fri, Mar 16, 2012 : 5:31 p.m.
Looks like a perfect Election year project to get organized. Now we'll all have good roads that lead to a bunch of vacant lots where businesses once stood. If the State starts to follow this lead, we are all in trouble. I have to disagree...the roads are always updated regularly in the township. And...vacant lots are actually better than junky properties; At least they are tearing them down. Fri, Mar 16, 2012 : 3 p.m.
Bravo &amp; kudos to the Ypsi Town Board!!! Brenda Stumbo and crew is giving the whole state a mark to hit. Keep up the good work and THANK YOU!!! Fri, Mar 16, 2012 : 2:40 p.m. The Township is eating the City's lunch, and everybody knows it. It is mind boggling that the council still believes in thinking inside the city's four square mile box. 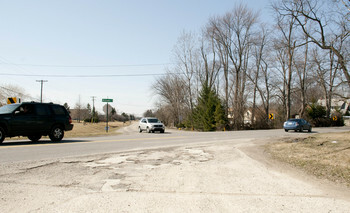 Fri, Mar 16, 2012 : 12:01 p.m.
Perhaps the Township can annex that section of Grove Rd. the City will not repair. Mon, Mar 19, 2012 : 3:08 a.m. The township already offered to fix that section of road and PAY for it, but the city of Ypsilanti somehow saw that as a bad idea and refused the money! Fri, Mar 16, 2012 : 3:52 p.m. I could not agree more! I hate driving over that section of Grove Rd and thinking about the damage it is doing to my car. Fri, Mar 16, 2012 : 11:05 a.m.